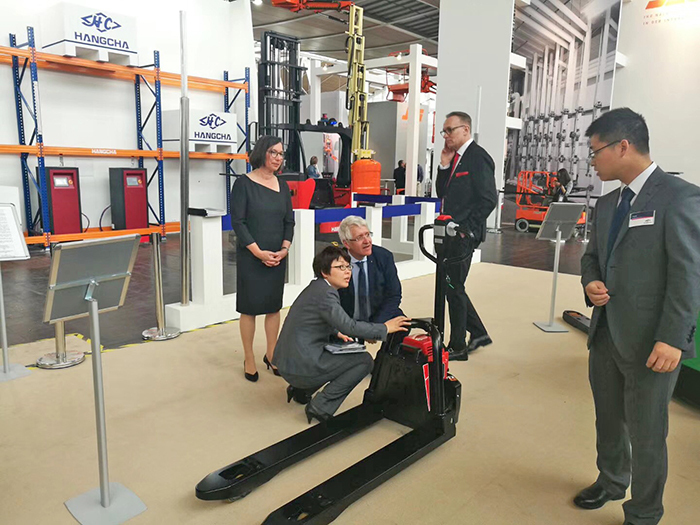 CeMAT 2018 – a world leading trade fair for intralogistics & supply chain management – took place from April 23 to April 27, local time, at the Hannover Exhibition Grounds, Germany. The exhibition wrote a new chapter for intelligent logistics, technological logistics, technology and equipment, and enabled the Industry 4.0 to step on a new higher level through demonstration of such technologies and products, by centering on the theme “Connected Supply Chain Solutions”. Meanwhile, CeMAT 2018 is going to set an agenda for global intralogistics industry, so as to push forward the digital integration and networking processes for value creation and supply chain. 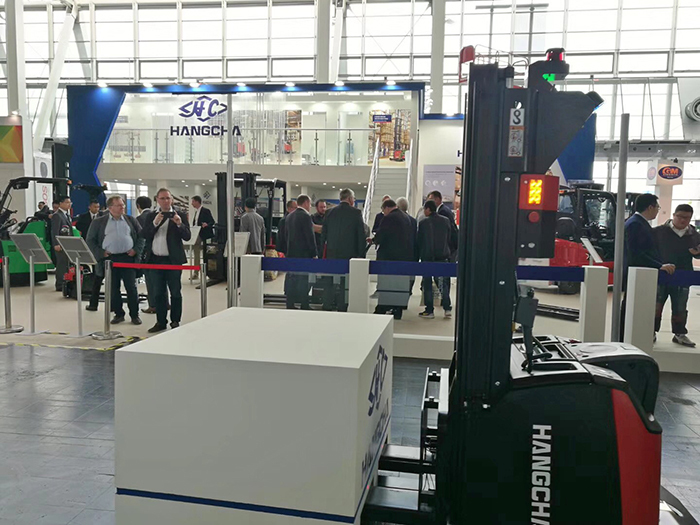 With the keynote of “Innovation and Value Creation”, Hangcha Group appeared at the CeMAT 2018 in Hannover with a dozen of new blockbuster products, including the new generation of internal combustion counterbalance forklift truck, electric counterbalance forklift truck, reach forklift truck, mini-series lithium-ion battery warehouse truck, four-wheel drive rough terrain forklift truck, elevating platform, and laser-guided AGV. Hangcha Group is dedicated to providing customers with more comfortable, more environmentally friendly logistics handling equipment and intelligent logistics solutions to realize easier handling work. As national policy attached more importance to environmental issue, together with rapid development of global logistics industry, the demand for lithium-ion battery product in the market is increasingly higher year by year. 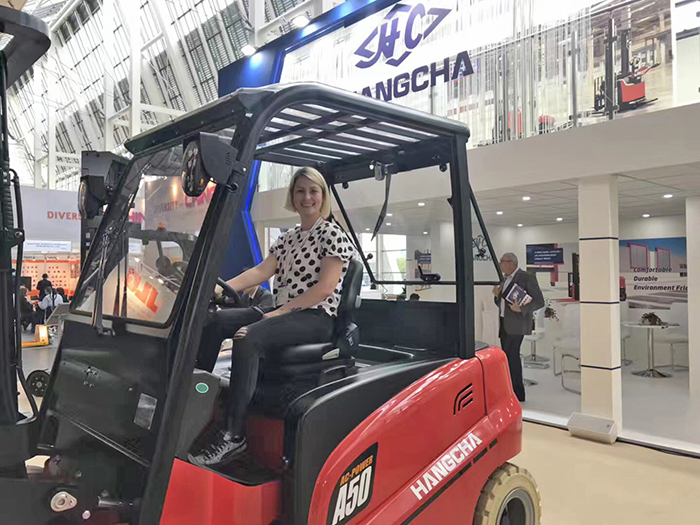 Environmentally-friendly lithium iron phosphate battery is applied for lithium-ion battery warehouse trucks that were exhibited at this exhibition, which features long battery service life, high efficiency, comfort, stability, and safety. Electric trucks of Hangcha that are being developed toward lithium-ion battery include not only warehouse trucks, but also counterbalance and reach trucks. To guarantee safety of lithium-ion battery during operation, the nationwide-leading BMS power management system is applied for lithium-ion forklift trucks. The power manager can realize communication between battery and electronic control unit, monitor battery temperature, voltage, and charge/discharge current in real time, and make accurate calculation on discharging status, so as to make sure that the battery always works in safe state, and to effectively extend service life and safety of the battery. The two AGV products that were exhibited at this exhibition feature intelligence, high efficiency, lean management, and information interconnection, as well as optimal task scheduling, shortest running path, minimum space demand, intelligent calling for station demand, lean management on capacity, complete data statistics, and simple system integration. The agile and smart intelligent management system of Hangcha covers design, production, warehousing, and automation management, automated equipment and various systems, and offers overall information-based and automated solutions for enterprise “intelligent logistics”. Hangcha booth at this Hannover logistics trade fair in Germany was set up by cooperating with a local famous booth erection company, with design elements that were consistent with the ideas to be expressed by the company, which showcased the charm of Hangcha products to the greatest extent, was very impressive, and created superb visual effect. With clearly defined AGV area, forklift area, discussion area, and meeting room, reasonable layout further offered it with outstanding “communication” capacity, and attracted many businesses and customers inside and outside the industry. The application of PDP TV and stereo system allowed activities at the site to be more diversified, and enabled us to achieve our desired goals and effect. Hangcha aims to build an aircraft carrier for materials handling. It has launched a large number of new products in this year. 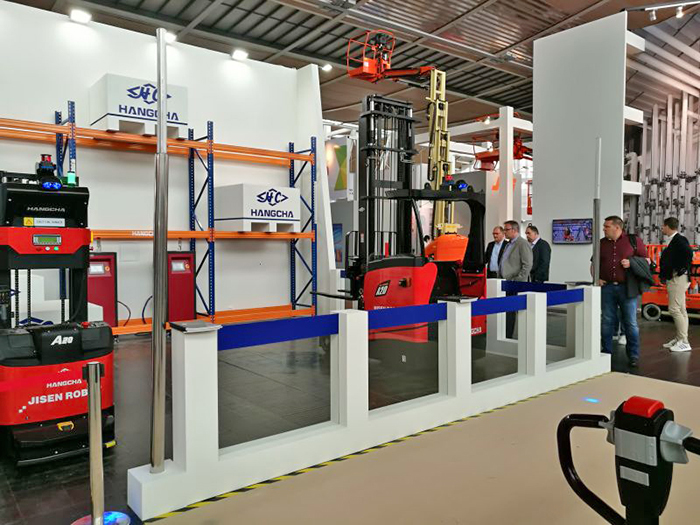 The full range of products that were showcased at the exhibition demonstrated in all dimensions the latest technology for materials handling trucks, new energy battery technology that is highly sensitive and more environmentally friendly, and convenient and safer operating system. The exhibition show also ignited the fervency of audience at the site. 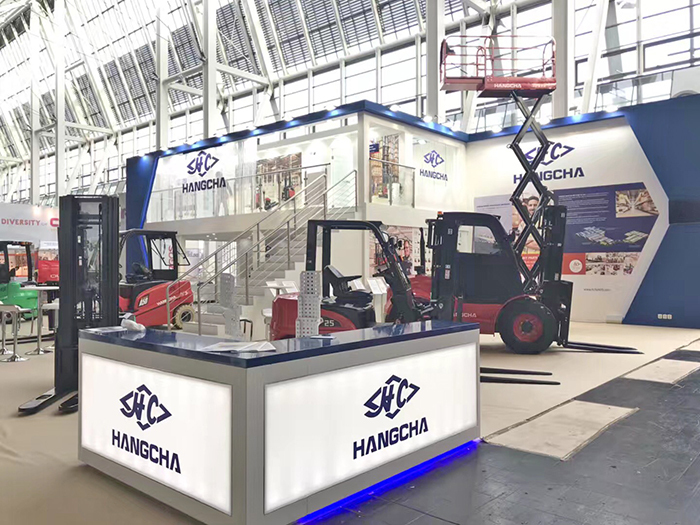 At this exhibition, Hangcha Group demonstrated the strength and brand of Chinese manufacturing with innovative products and perfect service, and will continue to lead the development of the industry during the great transformation of the industry. The Group received many new and old friends from all over the world, which increased the confidence and trust of customers to Hangcha. In the couple of days before the exhibition, and just for Germany, there were several dealers expressed their interest in becoming secondary agent under Hangcha’s agent in Germany, laying down solid foundation for Hangcha European office to further expand its market share in Germany. Looking back to the past years, Hangcha marched forward unceasingly with support from its friend distributors. 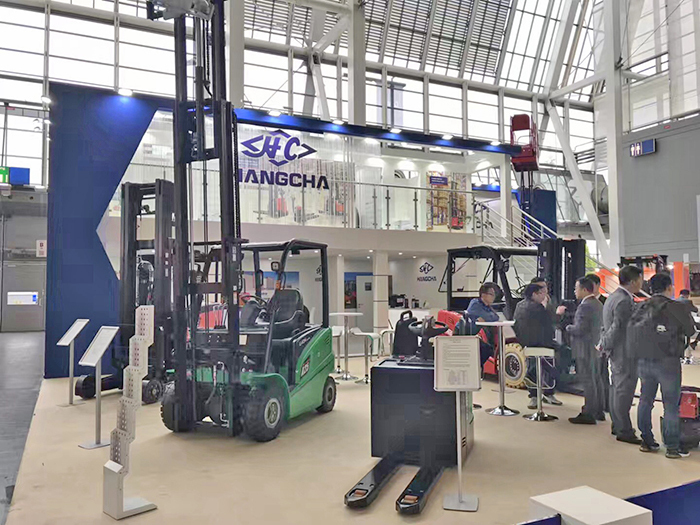 As a forerunner in the industry of forklift, Hangcha expects to achieve great success again in the combat of fierce competition. With full confidence, visions, and dreams, Hangcha will, by joining hands with distributors, run for dreams, be prepared for soaring, and strive to provide more customers with tailor-made logistics solutions.